. Published on July 17, 2014. There’s a generational disconnect in how businesses communicate with customers today. And it might be costing you money. In a late 2012 Forrester Research survey, participants in different age groups were asked if they prefer online customer service vs. talking with a service rep by phone. Generation Y (born 1980 to 2000) was the largest group to favor online communications, at 44 percent, followed by Generation Z (born 2001 and later) at 41 percent and Gen X (born 1965 to 1979) at 39 percent. By comparison, only 27 percent of Baby Boomers (1946–1964) said they preferred online communications for customer service. Even so, the phone is still widely seen among many small businesses and service providers as the most important channel for all customer interaction. This is where the big disconnect happens. Generations X and Y want to type. Most small businesses want to talk. What should you do about it? Start developing an omni-channel communications strategy. 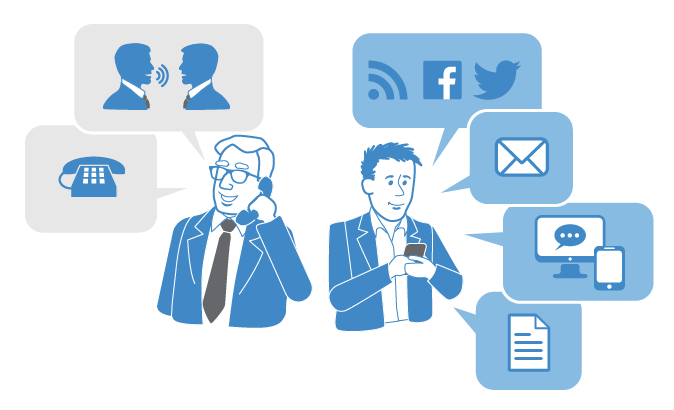 By omni-channel, I mean that the conversation between you and your customers flows freely in both directions across multiple channels. You’re giving customers multiple options for connecting to you: by phone, on Twitter and Facebook, in Web chats, and in email, instant messages, and text messages. Removing your customers’ potential frustrations is what omni-channel customer experience tools like MightyCall React are all about. We’re enabling small businesses to communicate in a seamless, convenient way with customers and prospects across the channels of their choice: social, Web chat, telephone, text, email, instant messaging. Omni-channel communications is only going to be more important in the future. If you’re not listening across multiple channels, you’re ignoring a lot of your customers and prospects. Besides, you never know when a simple tweet can turn into a lucrative transaction. For millennials, emails are a thing of the past. Phone calls and voicemail = the devil. The way to reach a millennial audience is through social media and text messaging. This articles helps to choose the best website builder for small business among the dozens of ‘top’ ones. Automated phone menus are a good tool for any business to have, but they’re tricky to get right.